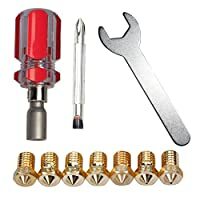 3dprinterwiki.info 3dprinters and parts are presently presenting the sought after Kweiny MK10 Hotend Kit for 3D Printer Makerbot | Upgrade Extruder Parts and Nozzle Cleaning Tools at a great price. 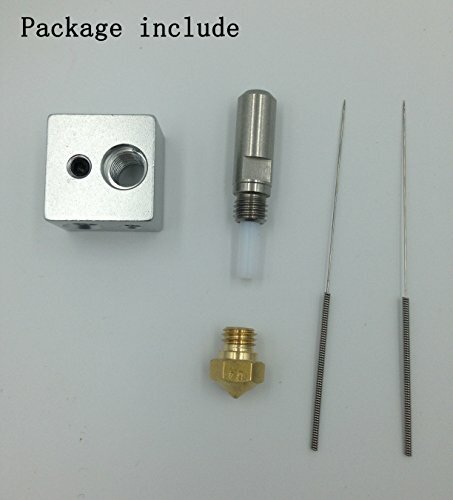 Don't pass it over - purchase the Kweiny MK10 Hotend Kit for 3D Printer Makerbot | Upgrade Extruder Parts and Nozzle Cleaning Tools online now! 2. Sharp parts, please keep away from children. Material: Stainless steel with 2mmX4mm PTFE tube. Nozzle cleaning drill bit: 2 pieces. Compatibility: Fit with MK10 hotend aluminum cooling block, such as DIY MK10 3D printer, FlashForge Creator Pro, FlashForge Creator X, FlashForge Dreamer, Dremel Idea, Builder PowerSpec 3D, Pro PowerSpec 3D X, Wanhao Duplicator 4S, Wanhao Duplicator 4X, Wanhao i3, etc. Brass material advantage: The heat conductivity of brass is 7 times as high as that of stainless steel. 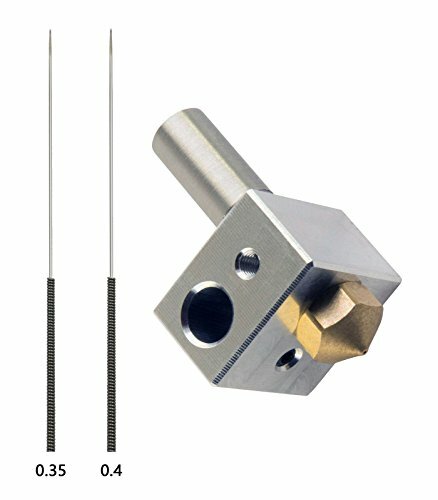 MK10 hotend structure only allows filament to have little contact with the nozzle. 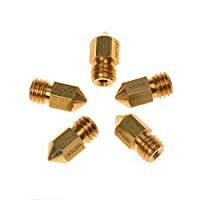 The material of the nozzle must be brass to ensure filament's temperature is the same as the thermistor, so it make the melt plastic more smooth. But the heat conductivity of stainless steel is so poor, it is unscientific and irrational used on MK10 nozzle. Quantity and specification: 1 piece MK10 hotend kit, it include these parts: 0.4mm nozzle 1 piece, throat with 1.75mm PTFE tube 1 piece, aluminum heater block 1 piece. 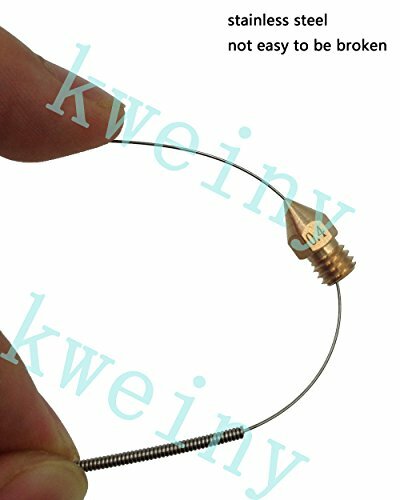 And 2 pieces nozzle cleaning drill bit(0.35mm,0.4mm) . 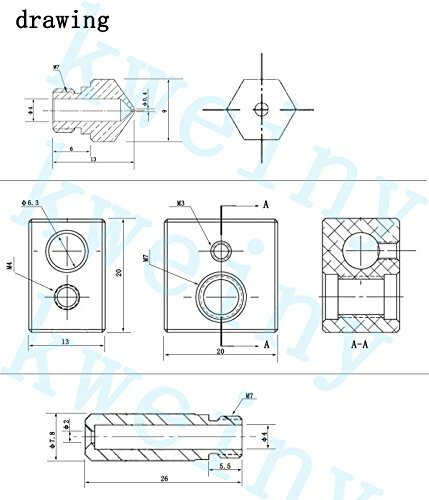 For detailed dimensions, please refer to the drawings in the upper left. 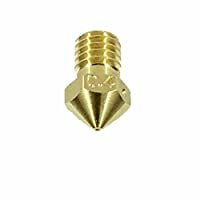 Material: Nozzle is brass. Throat is stainless steel. 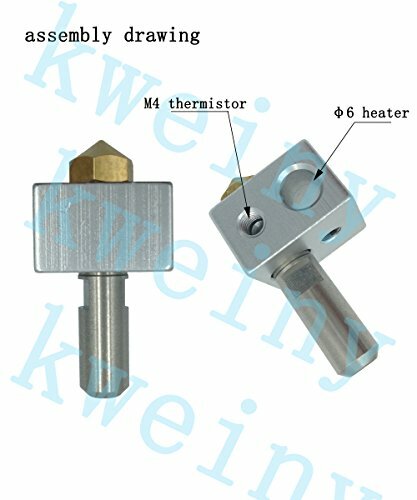 Heater block is aluminium alloy. 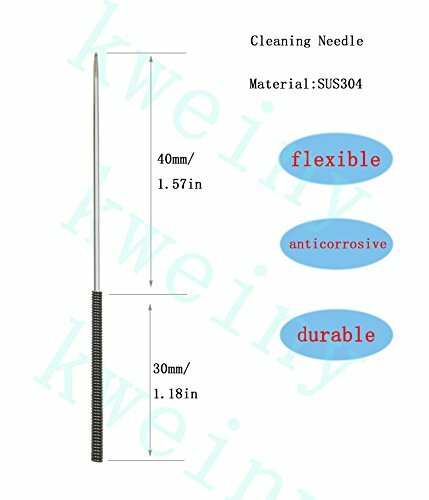 Nozzle cleaning drill bit is stainless steel SUS304. Cleaning skill: The best way to clean up the nozzle is to use the 0.35mm drill bit first, and then use the 0.4mm drill bit. You can twist the needle to make it easier to clean up.